If you have already got your eye on the yellow nail varnish that, as usual is likely to be a sell out from Chanel later this year then this colour might just be of interest. 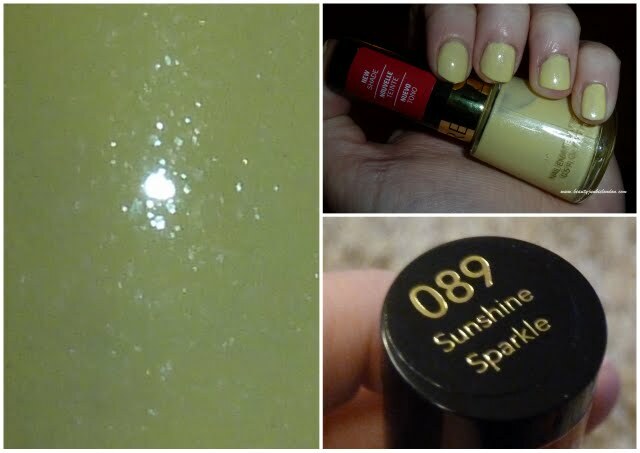 With an irresistible name like ‘sunshine sparkle’ it really is a little bottle of summer for your nails. And this is coming from someone who has a bit of a mental block when it comes to the idea of yellow nail polish. Normally all I can think of is smoker’s nails. But this has changed on seeing this shade – it’s a pretty pastel with enough shimmer to keep it pretty rather than stained-looking. The colour is creamy and takes 3 coats to make opaque. I’ve tried including a close up of the shade for the first time to show the colour as clear as possible. What do you think – does this help? What do you think of yellow nails? i picked this up along with tangerine and they are GORGEOUS! It does help and I do want it. Oooo I LOVE yellow nail colours! !